Restoring peace and harmony to an area of Stopsley has won an award for Luton police’s anti social behaviour team. The team took top honours in the Making a Difference category for the recent Luton Excellence awards. The judging panel believed the police’s work on a dispersal order in Stopsley deserved to be recognised. Actions from the police resulted in the transformation of an area from one were residents were in turmoil to normal order and the quiet neighboured resumed. Residents reported a range of anti-social behaviour incidents in the area caused by a group of youths, including criminal damage, shoplifting, loitering, trespass and burglary. Referrals to the Youth Offenders team, CCTV and home visits did not change the behaviour so the team issued a dispersal order from July 2014 to January 2015 as a final tool to prevent further disorder. 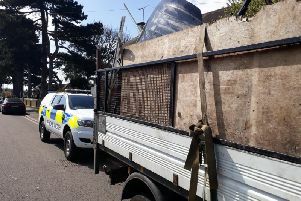 Patrols from the anti-social behaviour team and local neighbourhood teams resulted in arrests and, while the behaviour initially continued for the first few weeks, no further complaints were reported from August onwards. A resident who sold her house because of the issues later said she was in fact sad to be moving. A/Chief Inspector Jackie Holmes, the force’s lead for local policing in Luton, said: “Returning order in the neighbourhood was the result of dedicated police officers working hard and with professionalism to tackle crime in the area. “The team is committed to tackling crime and making the county a safer and more enjoyable place to live.